Klipsch debuts its Reference Premiere Dolby Atmos speakers | What Hi-Fi? While there's no shortage of Dolby Atmos-enabled home cinema amps on the market, speaker manufacturers haven't been quite as forthcoming with dedicated Atmos speaker solutions. KEF has its R50 module, Onkyo has a few Atmos-enabled systems and we've tested Pioneer's S-73A Atmos package. Now it's Klipsch's turn to launch an Atmos solution. 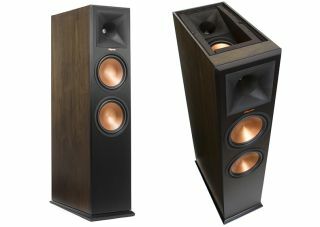 The Klipsch Reference Premiere line-up consists of three models: the RP-280FA floorstander ($2400 per pair), complete with built-in height arrangement. There's also the RP-140SA ($500 per pair). These module-like speakers can be added to an existing surround package, either as Atmos speakers or rear surround channels. Completing the line-up is the brand new RP-450CA centre channel ($850). Klipsch claims its Tractrix Horn technology, which features across these new models, will allow the speakers to "meet the directivity and sensitivity specifications that Dolby requires for Dolby Atmos-enabled speakers". The RP-280FA and RP-450CA are both available in either walnut or black real wood veneer, while the RP-140SA is available in a brushed black polymer veneer. UK pricing is still to be confirmed. MORE: DTS:X: What is it? How can you get it?